BACK ROW LEFT TO RIGHT: Robert Young (uncle of Mrs. C. Hitchcox), Ellsworth Morden, Mrs. Morden, Mrs. S.E. Bacon (daughter of the Rev. James Nisbet, first minister of the congregation), Miss Lillian McDougall, Wallace Hand, Roy McGregor, Thomas Nisbet (son of the Rev. James Nisbet), Mr. Campbell Morden. JUST BELOW THE BACK ROW: Robert Brodie (late husband of Mrs. Ann Brodie and Miss Muriel Hunter. 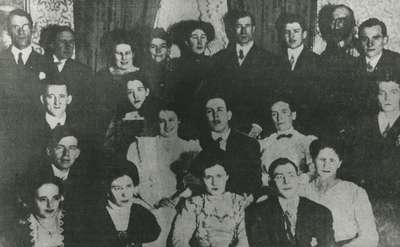 THIRD ROW: Robert Wilson, Mrs. Roy Shaw, Mr. Shaw, Mrs. William McNeil and George Jarvis (the organist and choir leader). BOTTOM ROW: Miss Muriel Morden, Mrs. Ann Brodie, Mr. & Mrs. Shaw and Miss Carrie Barclay (daughter of John Barclay, first clerk of session). The Morden family is also still represented in the congregation by Mrs. Sybil Morden, widow of the late Hardy Morden, an elder of Knox Church until 1971.